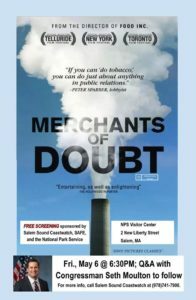 The National Park Service is partnering with SAFE (Salem Alliance for the Environment) and Salem Sound Coastwatch for a screening of the highly acclaimed film MERCHANTS OF DOUBT. Immediately after the screening, U.S. 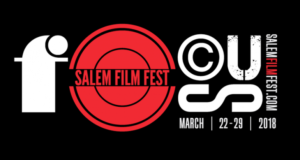 Congressman SETH MOULTON will be present for an audience Q&A. Despite new evidence that the fossil fuel industry has hidden its own research about global warming, the mass media often give climate science “skeptics” equal time. But MERCHANTS OF DOUBT sheds light on these pundits-for-hire—so-called experts whose job it is to discredit the scientific evidence on climate change. This film provides a satirically comedic look into how the fossil fuel industry has hired professional spin doctors to create doubt about the science behind climate change.